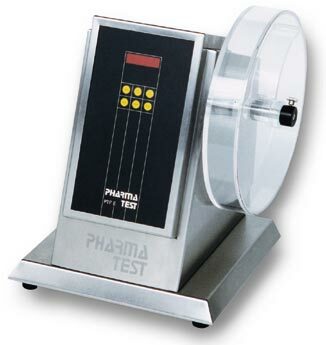 The PTF10E instrument is a basic single drum tablet friability tester. The drum rotation speed is fixed at 25 rpm with an accuracy of +/- 1 rpm (PTF10E) or variable within 20 - 70 rpm (PTF10ER). The total testing time can be set from 1 to 9999 seconds, or alternatively, set the total number of drum revolutions over the range of 1 to 9999. The PTF10E/ER will accept both the conventional "Roche" drum for Friability Testing as well as the Abrasion Test drum (with lamellas). The instrument can be equipped with the current 10° angle as specified by the USP , EP for larger tablets of 13mm diameter or greater.